The most basic way both Square and PayPal Here take card payments is through a magnetic stripe card reader that plugs into the headphone jack of your device. 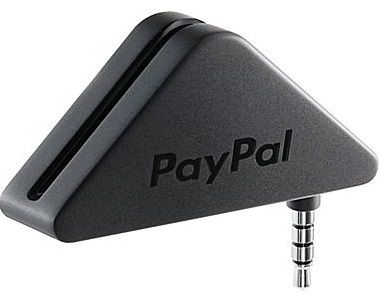 These basic card readers are available for free from PayPal and Square's websites. Square readers can also be purchased for $10 at many stores like Best Buy, Walmart, and more (see where to buy Square for locations), and include a $10 rebate code with purchase. PayPal Here readers are also available from certain retail locations, including some Staples and Office Depot/Office Max locations, for between $10 and $15. Additional PayPal Here readers can also be purchased online, and are $15 for any beyond the first free one. Please note the card readers are encrypted specifically for their own app, and are not interchangeable. 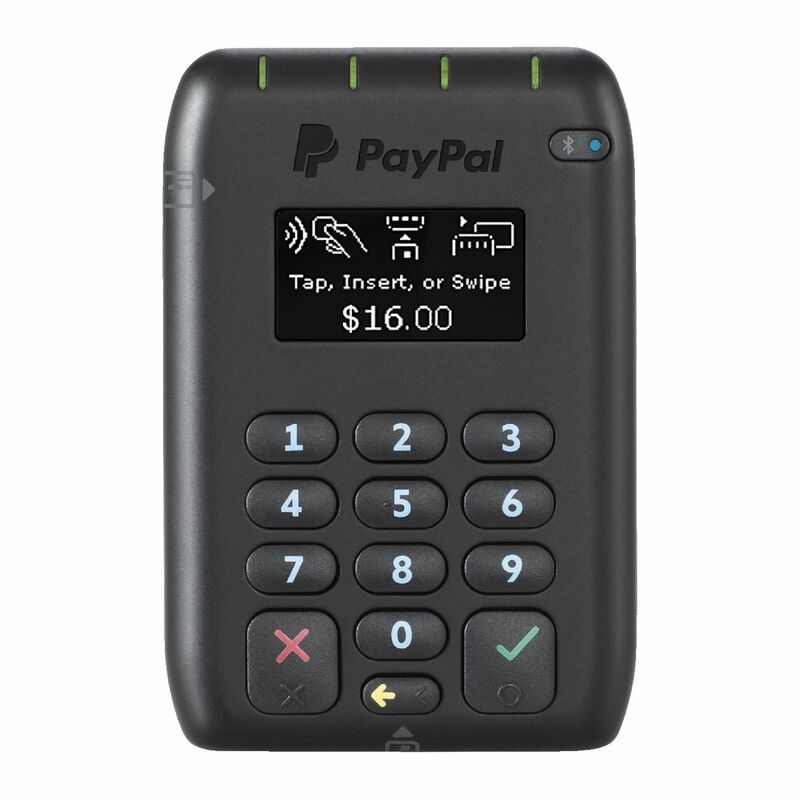 Both PayPal Here and Square have options for taking payments beyond the basic card reader, including chip card readers and NFC payment readers. 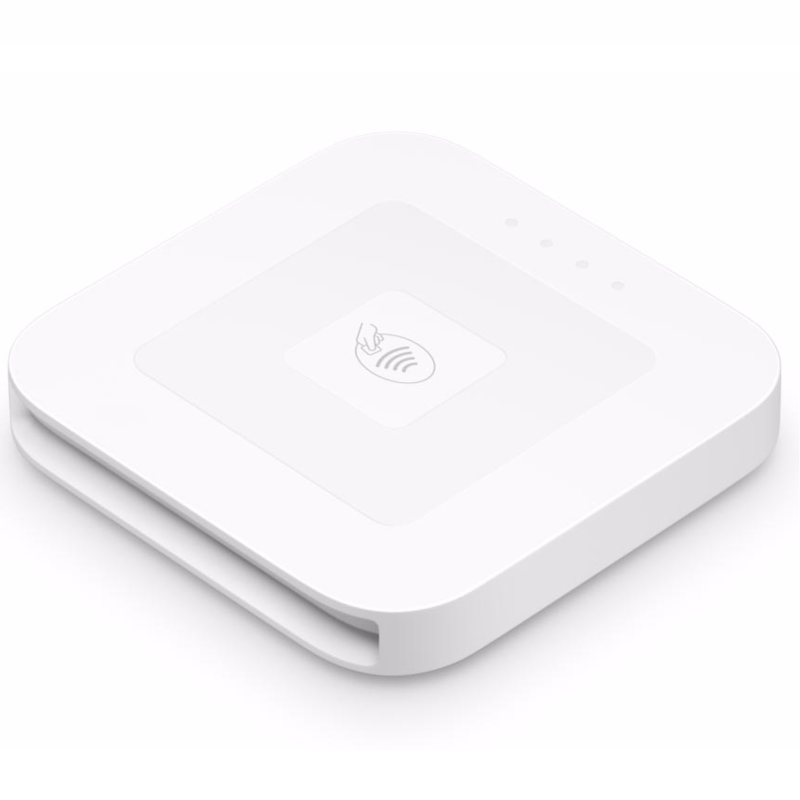 Square has a chip and magnetic stripe card reader, which resembles the basic card reader and also connects via the headphone jack, available from their website for $29. Square also offers a Bluetooth NFC and chip card reader, which is available from their website (and some retail locations) for $49 or with an optional charging dock for another $29. PayPal Here offers a mobile Bluetooth NFC and chip card reader, with pin pad, available from their website for $79. The Square Point of Sale app and PayPal Here app are both available for free in the App Store and the Google Play Store. PayPal Here is also available in the Microsoft app store. 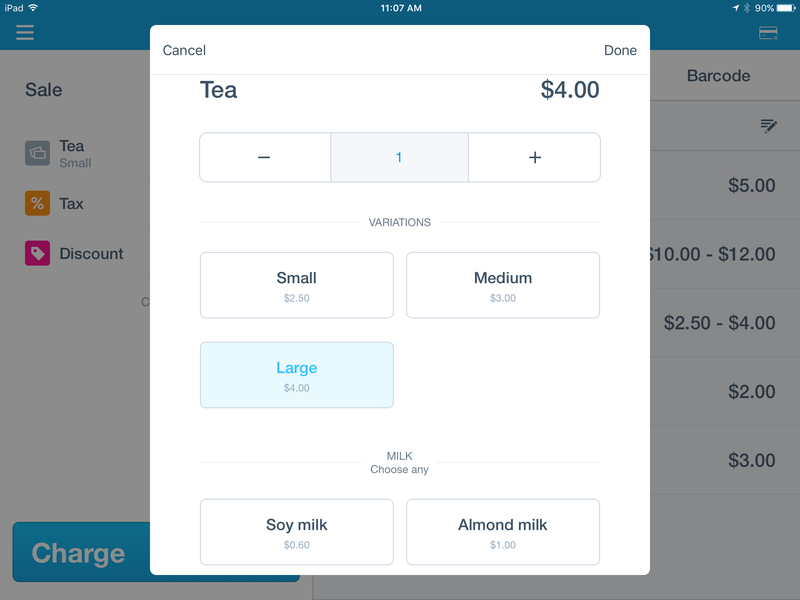 Square Point of Sale is compatible with iPads and iPhones running iOS 9.0 or later, and Android smartphones and tablets running Android 4.0 or later. PayPal Here works with iPhones and iPads running iOS 7.0 or later, Android smartphones and tablets running Android 4.0 or later, and Windows smartphones and tablets running Windows 8.1 or later. Within both apps, you can add or change items in your inventory. Entering item information is straightforward, and you can edit item name, cost, barcode or SKU, tax, and more. Both apps allow you to add and sort items into categories (such as "Drinks", "Desserts", or "Sandwiches"). They both offer the option to add item variations to products (such as different sizes or colors), as well as add modifiers to products, such as different condiments, flavors, etc. These item modifiers and variations can be used in a variety of ways. For instance, if you sell coffee, you can set up variations for each size of coffee you offer and modifiers for add-ons to the coffee, such as add soy milk or vanilla flavor. Below is an example of the same transaction in Square and PayPal Here, with multiple variations and product modifiers (click images to expand). Square can also do more in depth and bulk inventory management from the Square Dashboard (more on that below). PayPal Here does not offer any inventory stock management or bulk edits to inventory. 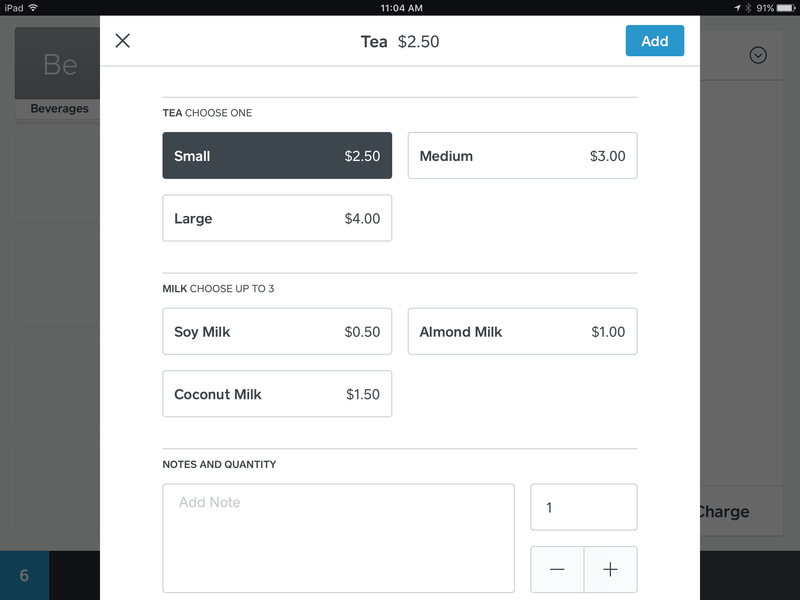 Navigating within the app, you can either scroll through your list of items, search by SKU/barcode, or enter a custom amount to charge a customer. Square also has an easy access Item Grid (only available on tablets) that displays 25 item categories or frequently sold products, which are customizable and rearrangeable. PayPal Here has a similar Top Selling Items category for easy access to these items. In terms of ringing up sales, Square and PayPal Here have a lot of similar features. You can add multiple tax rates, and both apps allow you to apply different taxes to different items. This allows you to, for instance, apply state tax to certain items and a liquor tax to other items. Both include the option to display different tip suggestions at checkout. You can also create and apply different discounts to entire orders, and Square allows you to apply these discounts to individual items in the order. In addition, both apps can issue partial and full refunds, and you can refund orders up to 120 days for Square, and 180 days for PayPal Here. Square offers an open ticket option, which allows you to start a transaction and put it on hold while you ring up other transactions. These open tickets are accessible across all synced devices, making Square more friendly to restaurants and bars, where open tickets may be necessary (as well as accessible across multiple devices). Square can also do split tender payments. PayPal Here does not have the option to keep open tickets or split tender payments. Square has the option to process payments offline. In order for Square to offer the option to process payments offline, they accept no responsibility for any declined payments taken while offline. PayPal Here does not have an offline option to process payments. It is unlikely that PayPal Here will add this option in the future, as PayPal does not want to be liable for declined payments. Setting up a PayPal Here account requires a either a Premier or Business PayPal account. If you don’t have a Premier or Business PayPal account, you'll need to set one up or upgrade your current PayPal account in order to use PayPal Here. Certain features, such as using the desktop application or adding employees (more on those below), require a Business PayPal account. As a part of set up, PayPal can sometimes require a credit check and/or background check. Using PayPal here does not require a monthly subscription or contract. To set up a Square account, there is an online form to fill out on their website. Square does not require credit check to set up an account, and there's no contract or subscription required (although Square does offer a separate subscription-based app, Square for Retail). PayPal Here allows for up to 1,000 users per account with a Business PayPal account. Each user account has its own login and individual permissions. You can track sales and run reports by individual user account. Other than reporting though, there aren't any specific employee features, such as an employee time clock or payroll options. PayPal does integrate with certain third-party apps that include features like payroll, but there aren't any employee management features native to PayPal. Square includes a paid option to add individual employees, for $5 per employee per month. Employee accounts with Square are protected with individual passcodes, and different permissions can be given to each account. Reports can be run by employee, including calculating tips per employee and revenue per labor hour. Square employee management also includes an employee time clock, and integrates with Square Payroll (which is an additional $25 per month). Setting up different locations with PayPal Here is possible, but there aren't any specific features for it. To add a second location, you can either set up a second user account as a second location, or if you already have multiple user accounts, they can simply be accessed from multiple locations. Your inventory and pricing will be the same across all accounts, and there’s no way to make location-specific changes. Square allows you to create individual business profiles for different locations, which can be tied to the same or different bank accounts. You can have up to 75 locations per Square account. Each location can have duplicate or different inventory items as other locations. Once you have multiple locations set up, new items can be added to a single location or multiple locations, and pricing for an item can be the same or different across locations. Both Square and PayPal Here can integrate with online sales. PayPal Here originated as a way to bring your online PayPal-based store into a physical space, so the online sales side of PayPal is fully fleshed out. You can use PayPal Here with your already existing online store, or set up an online store to integrate with your PayPal Here account. Square has a specific Online Store feature, with multiple options for store set up. You can set up a basic online store through Square, set up a website through Square’s partners, or use Square's APIs to accept payments directly from your previously existing online store (which requires custom programming). PayPal Here and Square have fairly similar hardware setup. The main difference between the two is PayPal Here uses the device camera as a built in barcode scanner. To use a barcode scanner with Square, you need to purchase an external Bluetooth scanner. For more information on compatible hardware, see our PayPal Here Basics Article or Square Basics article. 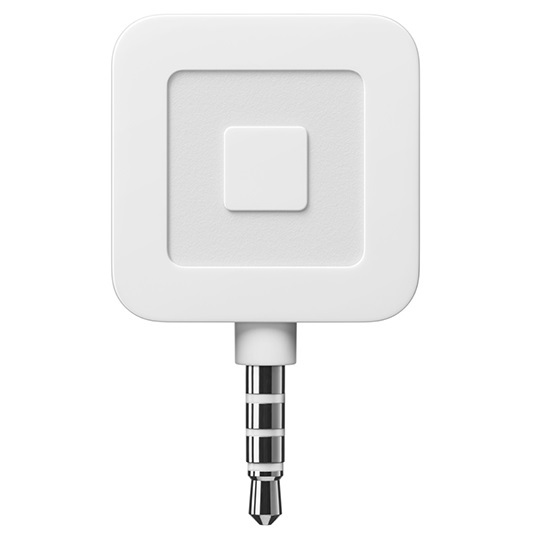 Square also offers the Square Stand, a stand with a built-in magnetic stripe card reader and USB hub. With PayPal Here, you receive funds almost instantly into your PayPal account. If you have a PayPal Debit card, you can spend funds directly from your PayPal account. If not, it takes a few days to transfer money from your PayPal account to your bank account. Additionally, PayPal can hold funds over $500 for a week (minimum). Square takes two to three days to receive funds into your bank account, but does not hold funds before transferring them. Both Square and PayPal Here offer online invoicing for your customers. As of writing, PayPal offers a fairly limited desktop application specific to PayPal Here. You can do simple inventory management from the desktop application, but it's the same as what you can do from tablets. For more in-depth inventory management such as tracking inventory stock, there are paid third party apps such as Shopventory that can integrate with PayPal Here. For analytics and reports, you can run these from within the PayPal Here app on your device. You can run sales reports by: date, user account, payment type or item, and they can be run by day, week, year, or a custom time frame. A copy of these reports can be emailed to yourself. Square offers a much more robust desktop application than PayPal Here. The Square Dashboard (see image on the right) is available as a web-based application for your desktop computer or as an iOS app. From the Square Dashboard, you can do detailed inventory management, track inventory stock, and set up low stock alerts. You can also edit your inventory in bulk, including uploading CSV files. There are a wide variety of reports you can run from the Dashboard: you can run reports on sales by most popular item, by date, by payment methods, and by category. You can dig deep into sales reports and see which days or times of day most sales happen, and what items sell most at those times. Square can also generate sales reports that compare current sales to sales from a previous week or year, and any of these reports can be emailed to yourself. 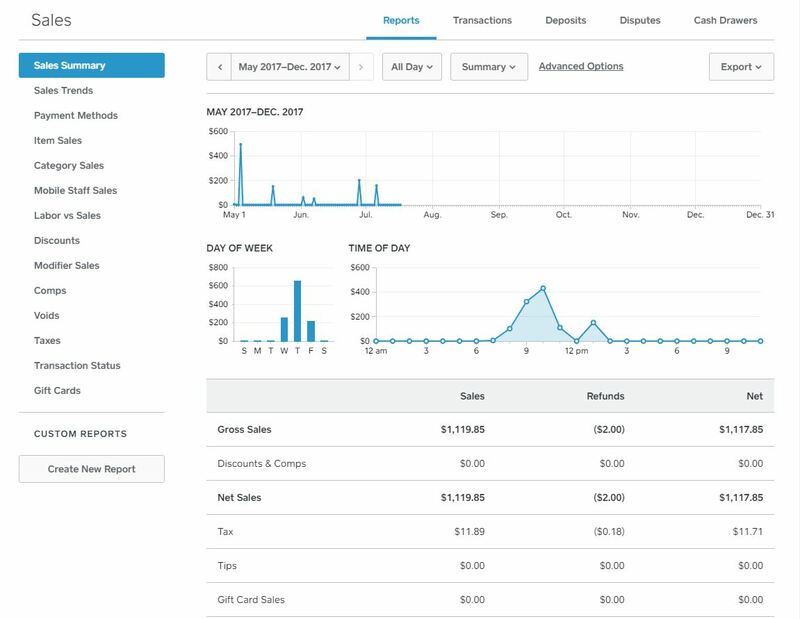 In addition, you can access customer analytics from the Dashboard, including trend reports for returning customers, see what's bringing in new customers, and set up customer loyalty programs. From within the Square Point of Sale app on your device, you can run limited sales reports over a certain time frames. Overall, if you're looking for a simple and straightforward way to accept card payments, especially if you already use a PayPal account, we recommend considering PayPal Here. It does all the basics, and does them well, but doesn't include many of the features that Square has. To set up a PayPal Here account, you need a PayPal account, and PayPal may run a credit check before or while setting up your account. The fairly limited desktop application has all the same features as PayPal Here on a tablet, so it's only really useful if you're running PayPal Here on a smartphone. If you already have a PayPal account that you're using for your business and are looking for a way to accept cards in a physical space, we recommend using PayPal Here. In addition, PayPal Here would be a good solution for individuals with small, mobile businesses, like contractors, craft shows, etc. If your business has physical storefront, and especially if it's a food-service business or a business with multiple locations, we recommend Square. Square has more features than PayPal Here, and while some of these may be excessive for very small businesses, many are useful and fill in gaps where PayPal Here is lacking. Features such as inventory management and stock tracking, multiple location features, and open or split tickets make Square stand out above PayPal Here. A downside to Square is the employee features are not standard, and require a $5 monthly subscription (per employee). Any article weighing either Square or PayPal Here would be remiss to not mention the negative reviews on both sides. Both have received reports of freezing accounts or funds without warning and inconsistent customer service, and PayPal Here has received many reports of holding funds over $500. Getting Square phone support requires a case number, and in order to get a case number, you must have an active account (which becomes a problem if your account is deactivated). PayPal Here has more easily accessible phone support, but also users report that customer support was unable to resolve their issues. While we don't believe that these reviews are enough to dissuade you from using either, they are something to keep in mind when making a decision. One final factor to keep in mind is switching between Square and PayPal Here is fairly easy, depending on how involved your inventory is. They both have free card readers, so it's mostly just a matter of getting the card reader, downloading the new app and signing up. There is a wide variety of hardware that is compatible with both of them (we recommend the Star TSP100III Ethernet interface receipt printer and the Star CD3-1616 cash drawer for hardware that will work with either Square or PayPal Here) If you choose one and decide it's not working out for you, you can always try the other. In fact, many users report having both, and using one for back-up. If you have any further questions on using PayPal Here or Square, please feel free to email us at [email protected] or give us a call at (800) 241-6264.